*LED light,widely used for bedroom,baby room,drawing room,closet,cabinet, corridor,basement,toilet,stairs and other places. *With 2pcs 2835 LEDs,4pcs AAA batteries for power supply(not included),environment friendly and low power consumption. 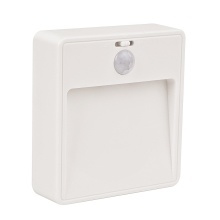 *Motion and light sensor,at dark place,it will light up automatically when you get into 3-5M(10ft-16ft)detection range. *Simple installation:an adhesive strip is included,which is easily attached to and detachable from the lamp body.No screws or nuts are required. *Also can be hang on the wall and used as door lamp at night,very convenient and practical for your daily life.